Lidar data, stored as either LAS files or ASCII files can be converted into multipoint features classes and managed in a geodatabase feature dataset. 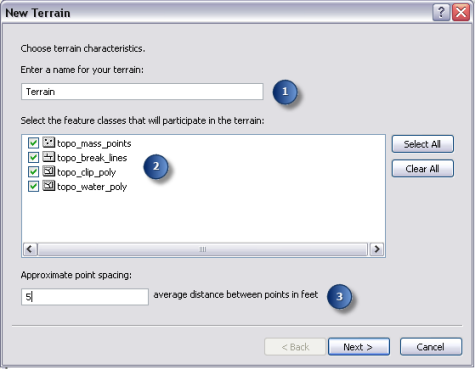 These multipoint feature classes can then be added to a terrain dataset using the New Terrain wizard in ArcCatalog or the Catalog window. Terrain datasets can be generated from several different types of data. Such data can include lidar points, sonar points, breaklines and points derived from stereo photography, and other forms of survey data. The feature class geometry types supported for terrain datasets include points, multipoints, lines, and polygons. ArcCatalog or the Catalog window provides access to the New Terrain wizard to create terrain datasets. The New Terrain wizard is part of the ArcGIS 3D Analyst extension. To ensure you have the ArcGIS 3D Analyst extension installed and enabled, verify the extension name is checked in the Customize > Extensions dialog box. The New Terrain wizard is recommended for creating a terrain dataset interactively. For data automation, accomplished via scripts and/or models, use the terrain-related geoprocessing tools found in the 3D Analyst toolbox. For more information on using geoprocessing tools see: Building a terrain dataset with geoprocessing tools. A feature dataset. A feature dataset must reside within a geodatabase. For information on the creation of a feature dataset, refer to the following sections: Working with geodatabase datasets and Organization of a terrain dataset in the geodatabase. One or more feature classes containing source measurements that reside in the same feature dataset. For information on populating feature classes with input source data, refer to Organization of a terrain dataset in the geodatabase. Average point spacing of measurements. For further information on point spacing of input data, refer to the section Average point spacing. The height source for each feature class. For information on height sources of input data, refer to Height source. The surface feature type of each feature class. For further information on the SFType of input data, refer to Surface feature type (SFType). A set of either z-tolerances or window sizes and reference scales used to define terrain pyramids. For information on terrain pyramid types, refer to Pyramids. The pyramid levels at which line and polygon features are to be enforced. Right-click the feature dataset to display the context menu. From the context menu, click New > Terrain. Type a name for the terrain dataset. 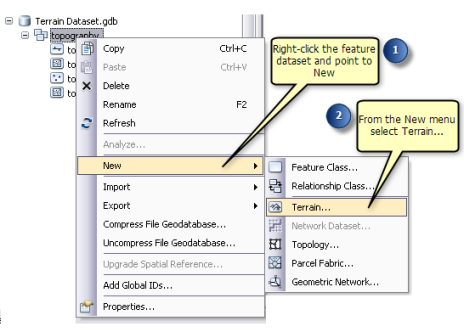 The feature classes within the feature dataset where the terrain is created are listed in the selection window. Choose the feature classes that are to be used to generate the terrain dataset by checking the check boxes next to the feature classes. Type the point spacing of the mass points. In most cases, the point spacing is supplied by the vendor along with the point data files. If the point spacing is not known, the LAS dataset or the Point File Information tool can provide a point spacing for the supplied data files. 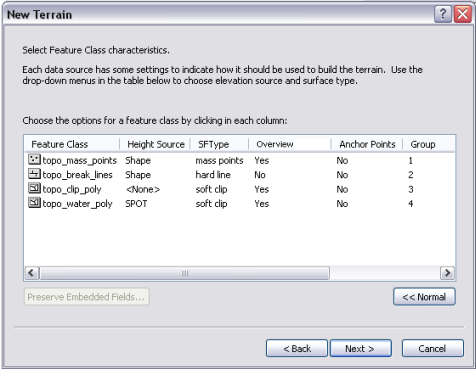 On this dialog window, determine how each feature class contributes to the definition of the surface within a terrain dataset. Each separate feature class requires settings. Use the drop-down menus by clicking in the table to choose the desired setting. Click the Advanced button to expose the advanced terrain settings for each feature class. Height Source—Indicate whether the feature class has a height value. For example, if the heights are to come from the shape geometry, select the SHAPE field. Surface Feature Type (SF Type)—Define how each feature class is to contribute to the terrain dataset. Overview—A generalized representation of the terrain, similar to a thumbnail image. Indicate which feature classes will be used in the overview scene of the terrain dataset. Anchor Points—Point in a feature class that remain through all pyramid levels of a terrain dataset. These points will never get filtered or thinned away. Group—Give specific group values to line and/or polygon features if they represent different levels of detail for the same thematic role (for example, a high and low resolution clip polygon). Embedded—Indicate whether a feature class containing mass points is to be embedded into the terrain dataset. Embedded Name—Name of the embedded feature class. This step defines the pyramid type to use to build the terrain dataset. Pyramids allow the creation of a multiresolution TIN-based surface, which improves overall efficiency. They are used as a form of scale-dependent generalization of the mass points data. Select a pyramid type to use to create the terrain pyramid levels. If the window size pyramid type is selected, indicate the point selection method to be used in the selection of the data point in each window. 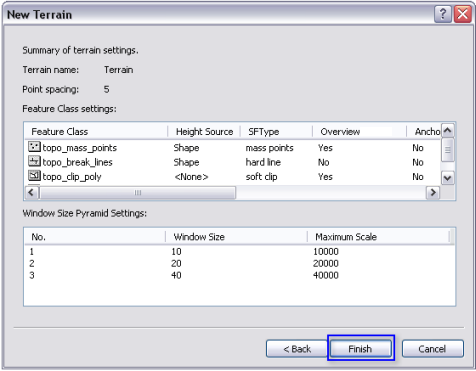 If the window size pyramid type is selected, optionally indicate whether further point thinning is required using the Secondary thinning method. The Secondary thinning method is used to further thin mass points over relative flat surfaces. A thinning threshold is required to specify the maximum difference in z a point can be from the selected window size point to be thinned out of the terrain. 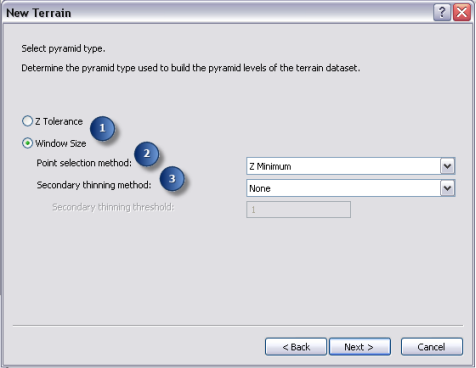 The terrain pyramid levels are created for a terrain dataset on this dialog box. The column indicating maximum scale is a reference scale threshold. A pyramid level is used to represent a terrain dataset between its reference scale and the reference scale of the next coarsest level. The column indicating the pyramid type will change depending on the identified pyramid type. Z Tolerance—The z-tolerance pyramid type utilizes vertical tolerance in the definition of the terrain surface resolution. Each pyramid level is an approximate vertical accuracy to the full-resolution data. Window Size—The window size pyramid level resolution is defined by equal-area windows at each pyramid level scale range. The highest-resolution pyramid level should use a window size that is equal to or larger than the average point spacing. 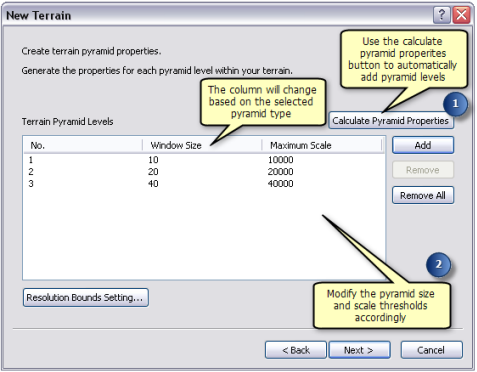 Click either the Calculate Pyramid Properties or Add button to add pyramid levels to the terrain pyramid levels window. Clicking the Calculate Pyramid Properties button will estimate default values. Refine and correct the pyramid levels based on knowledge of the data by highlighting the value and modifying it. The summary dialog box displays the settings that are to be used to build the terrain dataset. Evaluate the selected settings for the terrain. If modifications are required, click Back to complete any changes. If the terrain is ready to be built, click Finish. Once the Finish button is clicked, a message appears showing the progress of the terrain build process.